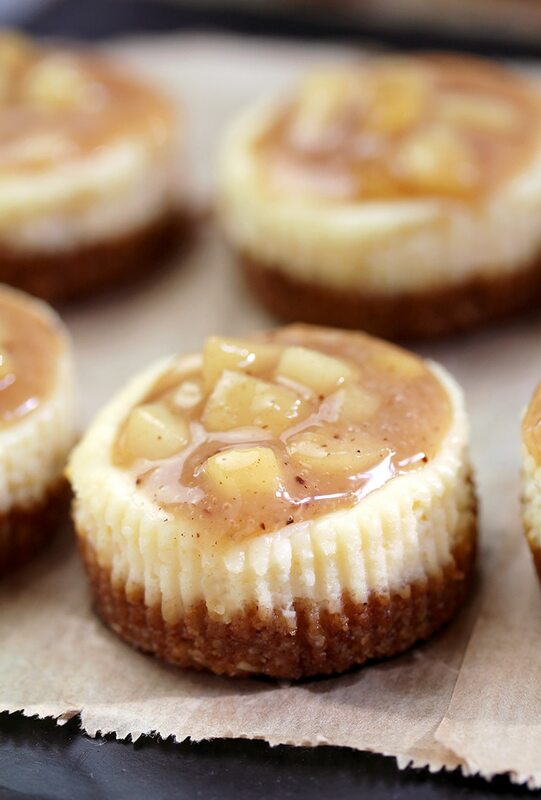 Caramel Apple Mini Cheesecake – delicious mini cheesecake with caramel topping and apples just perfect for fall days. I find fall inspiring. There are so many apple treats and preparing them is a real pleasure for me. 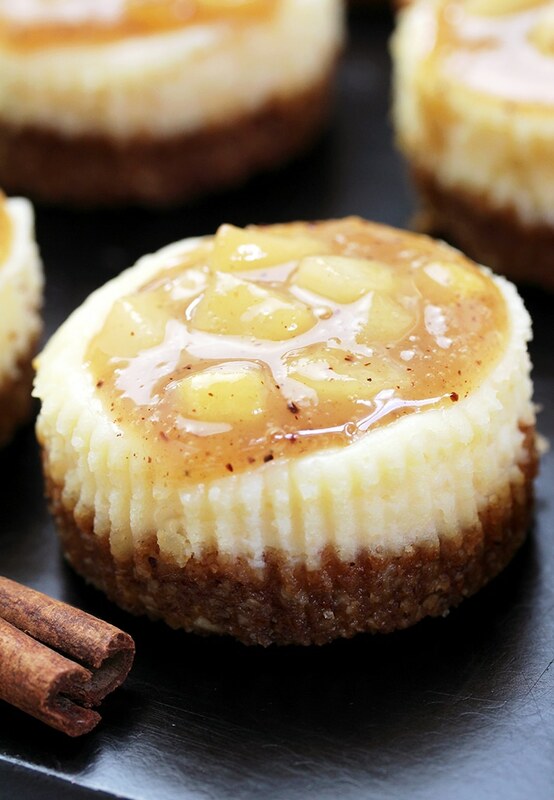 One of my favorite recipes is the one for Caramel Apple Mini Cheesecake. You really need to try them. 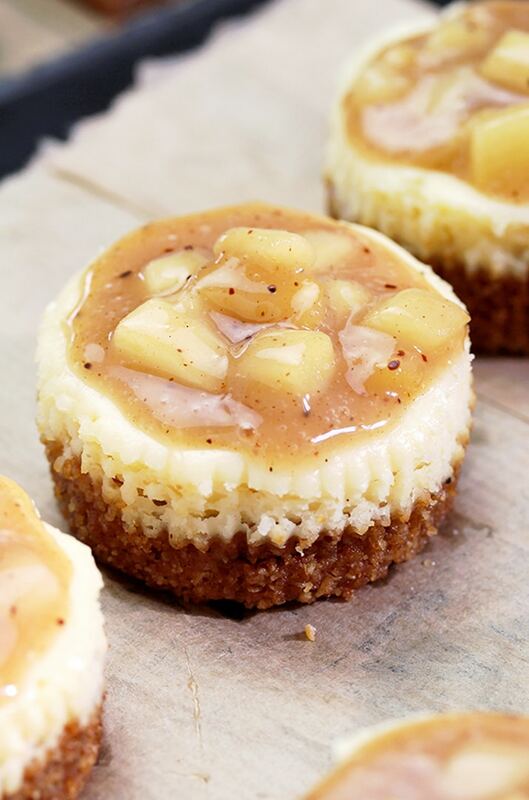 The combination of cheesecake, caramel topping and apple is so perfect. 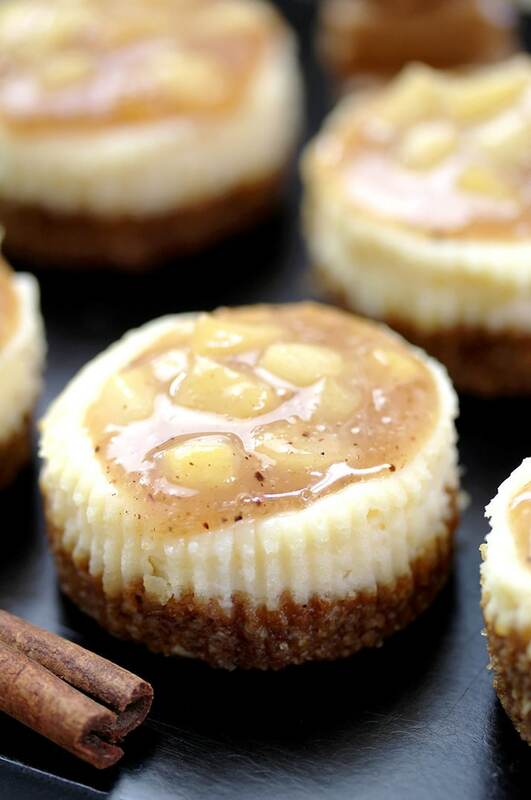 Caramel Apple Mini Cheesecake is really easy to prepare. You need graham crackers crumbs, sugar, cinnamon and melted butter for the crust. You simply combine the ingredients and put them in muffin paper liners and press lightly. Cheesecake consists of cream cheese, sugar, vanilla and eggs. Beat all the ingredients with a mixer and spread on the ground layer. Bake at 350 degrees for 15-18 min. You will need apples, cinnamon, nutmeg, cornstarch, sugar, water, salt, vanilla and caramel topping to make the topping. Cook first six ingredients over medium heat, for about 10 minutes, stirring them from time to time, until the apples soften. Add vanilla and caramel topping, stir well and cook for another minute. All that‘s left to be done is to wait for cheesecake and topping to cool and you can enjoy. 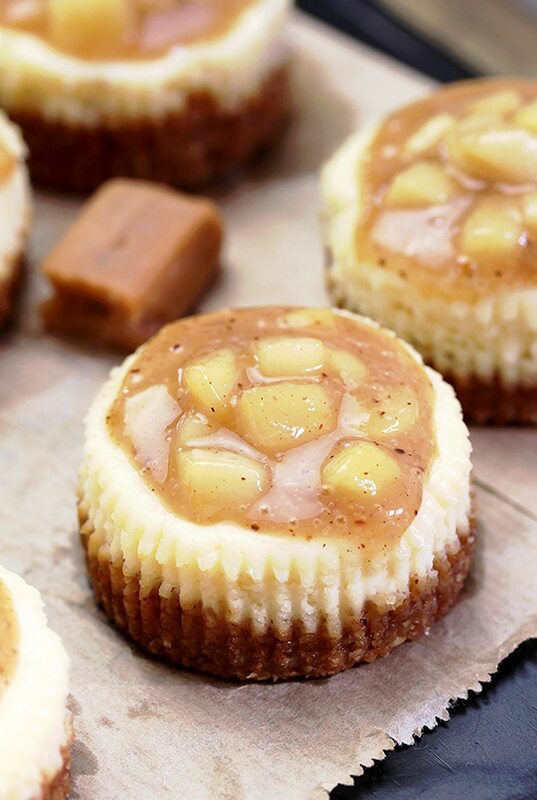 I suggest Caramel Apple Mini Cheesecake to be a Thanksgiving dinner dessert, because you can‘t imagine it without a good dessert, can you? Make your holiday table complete with this delicious, beautiful dessert. All apple dessert fans should check out our recipes – Layered Apple Lasagna Dessert, Caramel Apple Crisp and Caramel Apple Chimichangas. If you prefer cheesecakes, take look at the most popular cheesecake recipes on our blog – No Bake Chocolate Peanut Butter Mini Cheesecake, No Bake Strawberry Cheesecake and Easy No Bake Oreo Mint Cheesecake. My suggestion for making your Thanksgiving dinner sweeter is – Cranberry Cheesecake Fluff Salad, Pumpkin Sugar Cookies with Cream Cheese Frosting and Pumpkin Lush. Let‘s make the best of apple season by preparing tasty desserts and enjoying them. Have a good appetite! Preheat the oven to 350 degrees. Line muffin pan with 12 muffin paper liners. To make the crust – in a small dish combine graham cracker crumbs, sugar, cinnamon and melted butter. Spread the mixture evenly on the bottom of the muffin paper liners and press down with a spoon or bottom of a glass. To make the cheesecake layer – In a large dish beat, with an electric mixer, cream cheese and sugar until creamy. Add vanilla and eggs and beat until well combined. Spread the mixture evenly over the graham cracker layer. Bake for 15-18 min, until center is set.Take out of the oven and leave to cool completely at a room temperature. Then, transfer them to a fridge for at least 4h, possibly overnight. To make the caramel apple topping - put apples, cinnamon, nutmeg,sugar, salt, cornstarch and water in a medium pan and cook for about 10 min over medium heat, stirring from time to time, making sure that apples soften. Add vanilla and caramel topping, stir and cook for about a minute. Remove from heat and let cool completely. 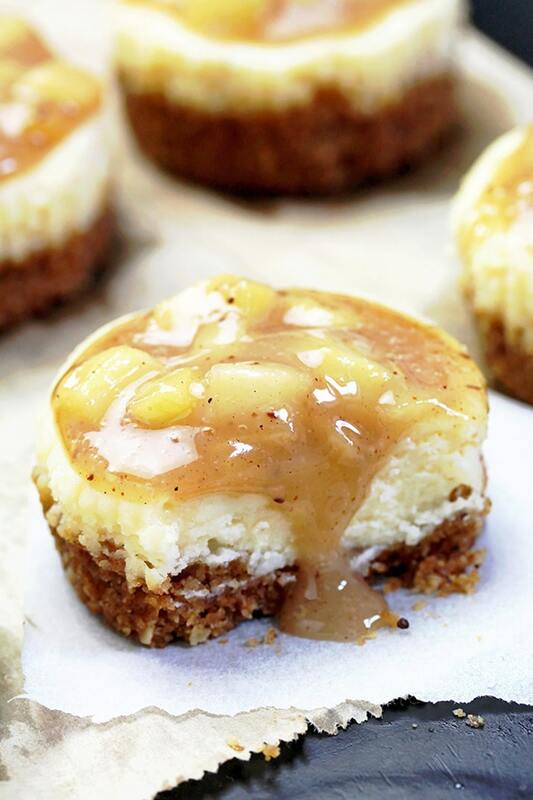 Top cheesecakes with caramel apple topping.